From the landscape to the woodfire scent to the flavors to sample. There's much to absorb. Take your time. Explore the varieties of Morgan Creek wines as well as the craft beers produced at nearby Schell's Brewery. You can also combine a tasting with the wood-fired cuisine of our Wine Cafe. Tastings can range from self-guided sipping to a personalized afternoon of tasting with the wine maker at the foot of the vineyard. Tour include an overview of grape growing in Minnesota and wine making from crush to the bottle. Private wine tasting event including menu. $35/person groups of 15-50. Private tasting with the Winemaker (monthly by reservation only) $25.00/person. Call the winery at 947-3547 for reservations for tastings with the wine maker and private wine tasting events. 11 a.m. to 5 p.,m. At Morgan Creek, our food offerings are planned, prepared and designed to bring a robust and exciting experience in European-inspired cuisine. 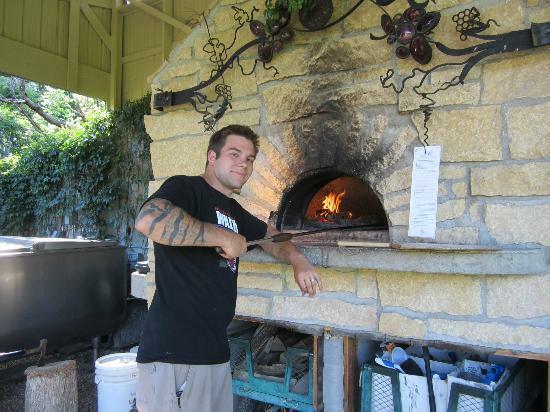 Whether for large gatherings (weddings, grooms dinners) or intimate (Monthly Chef Special) we are proud and excited to offer unique dishes composed with locally produced goods, including organic specialty baked goods from River Rock Coffee in St. Peter.and a gourmet wood-fired appetizer menu. 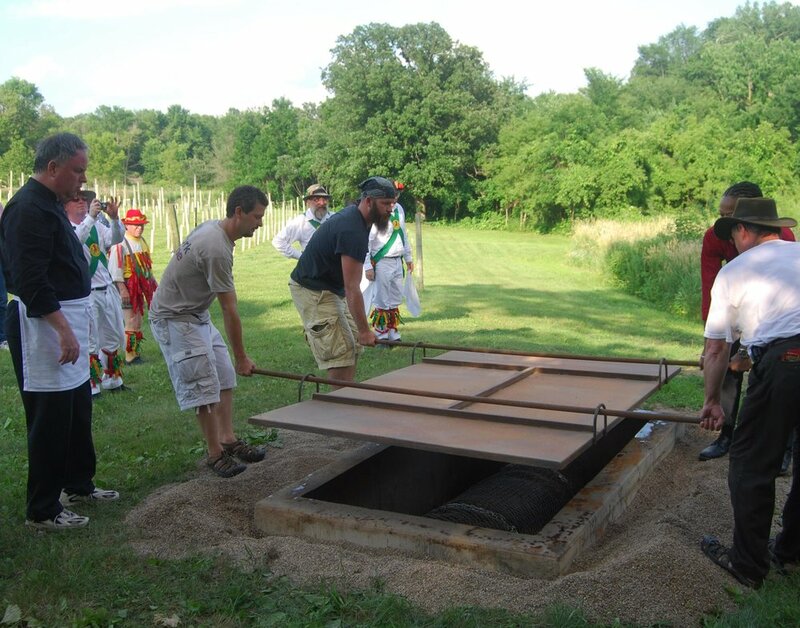 Closing the pork-roasting pit for the "Farm to Fork Wine Dinner." You haven't tasted what Southern Minnesota can do until you've attended one of Morgan Creek's signature evenings of food and drink. In addition to monthly chef specials, Morgan Creek offers some incredible adventures in eating. Click on the following to learn more about when, where and why.